Most people who dislike tofu, in my opinion, probably have never tried it cooked the right way. People tell me "but it doesn't taste like anything".... that's the problem. 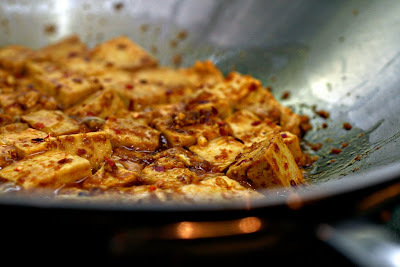 Tofu needs a lot of flavouring, it really should be marinated (ideally overnight). I grew up eating the stuff, so I can enjoy it in it's very minimalistic state (with a bit of tamari and nutritional yeast).... but that's just me and my crazy family. Most people can learn to appreciate and enjoy the taste and texture of tofu when it is heavily marinated. That's why I was so excited to try this recipe for lemongrass tofu. It's marinated and heavily spiced, and it turned out incredible! I served it with coconut rice (an old favourite Moosewood recipe) which basically involves cooking the rice slowly in coconut milk and turmeric. It's so creamy & delicious! Rinse & drain the rice. In a saucepan over medium heat, saute the rice, turmeric & salt for a few minutes (stir constantly to avoid burning). Then add in the water and coconut milk. Bring to a boil, then reduce heat and simmer, covered, until the rice is cooked and all the liquid is absorbed. Takes approximately 15-20 minutes. I followed the recipe almost exactly, except that I stir-fried some onions, mushrooms and fresh coriander in olive oil and added it to the tofu to make it more of a complete meal.